NYC Airsoft | Connecting airsoft players in New York, New Jersey, Pennsylvania, Connecticut and around the world. NYC Airsoft is the definitive guide to airsoft for NYC. Tickets will NOT be sold at the field. EMR sells all required safety gear and Jakal Airsoft will be offering airsoft guns and tactical gear for sale as well as BBs and green gas. Evike.com is coming to the East Coast to hold their annual customer appreciation game, co-produced by Moondog Industries and EMR. A portion of the event proceeds will be donated the JDRF (Juvenile Diabetes Research Fund). The Tantalum Contract is a MilSim game set in the shadowy world of Private Military Contractors in Africa. This game is for players who can role-play and can handle more realistic wounding and kill rules. Proceeds from the event will be donated to the Intrepid Sea, Air and Space Foundation. Registered players will receive a complimentary raffle ticket with prizes provided by On Target Paintball. The Contract Series is for players who enjoy role-play, realistic wounding and kill rules, and mission objectives go beyond getting ‘moar kills’. Mature and honorable players only. Choose 1 of 3 factions. 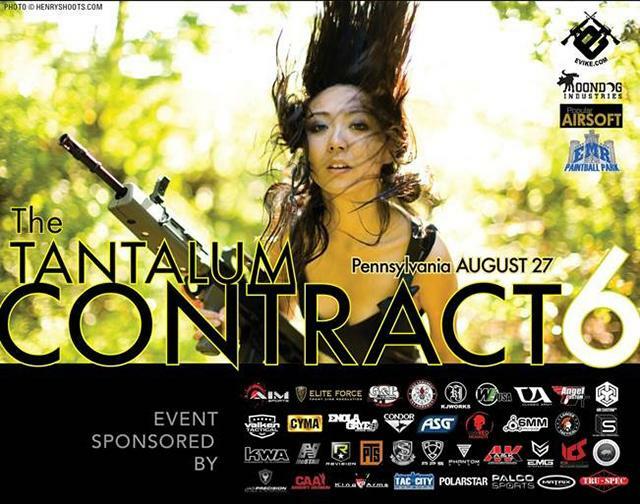 This exciting event will take place at an insured & sanctioned Airsoft park for a day of controlled and organized fun! Tantalum Contract 8 features heavy trigger time in an objective oriented scenario. It is a battle for a cause and is made possible by the responsible and awesome Airsofters like yourself! While many experienced and honorable players use and play airsoft with HPA guns without any issues, our sport’s worst cheaters and malicious players are drawn to any mechanical advantage that allows them to lord it over other players. HPA guns allow a user the ability to easily adjust the FPS and ROF of their guns after chrono testing. HPA gun’s electronic triggers allow them very responsive semi-auto fire, to the point, that they can effectively fire as fast as full-auto guns. Our only other option is to completely ban HPA guns (which some Milsim producers have done). We hope it doesn’t come to that. Evike.com is coming to the East Coast to hold their annual customer appreciation game, co-produced by Moondog Industries and EMR. A portion of the event proceeds will be donated the Leukemia Lymphoma Society and the JDRF (Juvenile Diabetes Research Fund). All tickets must be pre-purchased through Evike. Smok’n Jay’s BBQ will be offering delicious meals for sale, Friday, Saturday, and Sunday, including hot breakfast, lunch and dinners. Active-Duty military, law-enforcement and firefighters get $20 off admission with photo ID proof of active-duty status. Pre-Registration required. Contact Ian Conolly or Thomas MOONDOG DelMundo III on Facebook for validation. Uniform: Brown/desert camo including UCP/ACU, ABU, and MultiCam. No black vests. Uniform: Green or Sky (blue) camo. No black vests. A nuclear holocaust has rendered most of the planet a desert wasteland. Radiation levels are incalculable. A shadowy government agency contracted Vault-Tec to build a network of underground Vaults to house the survivors. The Master has built an army of mutant survivors and outcasts, as well as a fiercely loyal unit of heavily armed soldiers called The Enclave. Players must use game supplied 0.25g Evike Matrix BB’s for PHASES 1 and 2 of the game (supplied free of charge.) Player’s may use their own BB’s for PHASE 3. Operation: Wasteland is a sci-fi variant of a MilSim airsoft game. All factions start with limited ammunition and must find extra ammo on the field or trade bottle caps for more from the Caravan or The Merchant. Teams must find Rad-X Boxes and hoard them in their HQ. The team with the most Rad-X Boxes at the end of the game will be the winner. Teams may raid other team’s HQ for their boxes and supplies. Each phase of Operation:Wasteland will have specific rules of engagement and authorized weapons. Each phase will also have tasks, missions and objectives that must be completed before leveling up the phases. There are three distinct teams fighting throughout the Wasteland. Each faction has their own motivations and ideas on how the Wasteland should be explored, and ultimately, conquered. Non-faction players act as antagonists, allies and guides throughout the Wasteland. Some characters will aid you, for a price. Some character’s sole motivation is to destroy you and your entire faction. The Enclave are a unit of heavily armed soldiers, using almost indestructible Power Armor Suits. The Enclave are generously paid for their allegiance to The Master. The mutants are a human race that could not escape the effects of the nuclear fallout. They are loyal to The Master, and will stop at nothing to rid the Wasteland of interlopers. The Vault Dwellers have been living in seclusion for the past 100 years. They possess very unique medical abilities, but are scared off very easily. The Merchant is a self serving, mysterious character. He takes pride and joy in providing the best possible deals on ammunition, equipment and supplies in the entire Wasteland. The Master is a shadowy figure, controlling the Wasteland from a secret location. No one has ever seen The Master, and reports on his or her whereabouts never lead to capture and prosecution. • All required safety gear: goggles, radio, red rags, etc. The EMR is a full service paintball field and offers free air fills for OPBB players running P* and external tank powered guns. Tournament locks or locking regulators required. Uniform requirements will be strictly enforced. Team uniforms are defined by color and pattern. Vest color does not matter. Background: Farmers, regional police defending their villages from potentially infected outsiders. Reports of deserters from factions (in full uniform) joining their home tribe are filtering out of the conflict zone. This is an INVITE only OPFOR team. Players must contact Headkill or Moondog to request to join. Players must bring all of these required items to sign-in. Players lacking any item will NOT be allowed to play. No exceptions. The California Academy of Science, The Exploratorium, and the Intrepid Sea Air and Space Museum. All tickets must be purchased at Evike.com. No walk-on tickets will be sold at the event. Deadline for refunds is Monday, September 5, 2016. • Players must use game supplied 0.25g Evike Matrix BB’s for PHASES 1 and 2 of the game, which will be supplied free of charge. Player’s may use their own BB’s for PHASE 3. Operation:Wasteland is a sci-fi variant of a MilSim airsoft game. All factions start with limited ammunition and must find extra ammo on the field or trade bottle caps for more from the Caravan or The Merchant. Teams must find Rad-X Boxes and hoard them in their HQ. The team with the most Rad-X Boxes at the end of the game will be the winner. Teams may raid other team’s HQ for their boxes and supplies. Uniform requirements will be strictly enforced. Vest colors do not matter, with one major exception.. Team uniforms are defined by shirt/top color and pattern. Headgear should be as close to the shirt pattern as possible. The Tantalum Contract is a MilSim game set in the shadowy world of Private Military Contractors in Africa. The Contract Series is for players who enjoy role-play, realistic wounding and kill rules, and mission objectives go beyond getting ‘moar kills’. Mature and honorable players only. Choose 1 of 3 factions. Each Faction will be playing on behalf of one of three charities. The winning team’s charity will receive the lion’s share of the charity pot and the other teams will split the remainder. This exciting event will take place at an insured & sanctioned Airsoft park for a day of controlled and organized fun! Op. Tantalum Contract 6 features heavy trigger time, free food, raffles, it is a battle for a cause and is made possible by the responsible and awesome Airsofters like yourself! Lets get out and play Airsoft!